Sathiguru Arjun Dev Ji Maharaj is blessing us today. In this shabad, there are two main meanings which we can take away. This shabad has been recited by Sri Guru Arjun Dev Ji Maharaj, thanking Waheguruji for taking away the fever, the illness of Sri Guru Hargobind Sahib Ji Maharaj. However there is also an internal meaning, a spiritual meaning. Through Sathiguru Ji's grace, we will try to look through both parts of this shabad today. Nihaariaa means to see, prabh kae means belonging to God, charan means feet. When I saw the feet of God, when I felt the feet of God, when I experiences God's presence, what happened? Sookh ma(n)gal kaliaan sehaj dhhun. I was blessed with sookh, sookh means happiness, ma(n)gal is joy, kaliaan means liberation, sehaj dhhun means a state of spiritual balance. All of these things came when I experienced the feet of God. When we ask, what are the feet of God, Guru Gobind Singh Ji Maharaj tell us in Jaap Sahib, chit charan naam. To have The Name of God in your conciousness, to repeat The Name of God, that is to hold on to the feet of God. When I experienced The Name of God, what happened? I was blessed with happiness, I was blessed with joy, I was blessed with liberation, I was blessed with inner spiritual peace; prabh kae charan nihaariaa, when I attached myself to the feet of God. Looking at this in another way, in the Amir Bhandar Steek of Sri Guru Granth Sahib Ji Maharaj by the Sato Gali Walae sampardaa, the way they interpret this tuk, is that when Guruji blessed me with their Bani, when I heard the Bani, the dhhun (dhhun can mean sound), when I heard The Bani of The Guru which spoke about that Waheguru Who gives happiness, Who gives joy, Who is The Liberator, when I heard that Bani, what happened? Sehaj – meaning easily, prabh kae charan nihaariaa, I came to see the feet of God, I came to experience God. So Guru ke piaareyo, Guru Arjun Dev Ji Maharaj is saying peace, happiness, liberation, inner spiritual realisation, this all comes from meditating upon The Name of God. 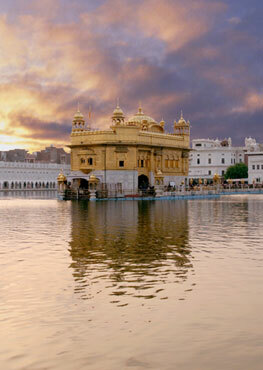 Raakhanehaarai – That protector Waheguru, raakhiou – has saved, has protected, baarik – the child. Sathigur thaap outhaariaa. Sathiguru, The True Guru, The Eternal Guru, thaap outhaariaa, has taken away child's fever. Thaap means fever, outhaariaa means to take away. This shabad is talking about the time when Sri Guru Hargobind Sahib Ji Maharaj had fever, and when that fever was taken away through the grace of God, Guru Arjun Dev Ji Maharaj sang these shabads. Another way of looking at this is, raakhanehaarai raakhiou baarik. We are all children of God. That protector Lord God Waheguru has protected the child who is focussed upon the feet of God, and what happens when you focus upon The Name of God? Sathigur thaap outhaariaa. The Eternal Guru, The True Guru takes away your thaap, your fever of ego, your fever of greed, your fever of attachment. All of these fevers which are attacking us, they are taken away with the grace of The Guru. Those people who come into the protection, the saranaaee of sathigur, The Eternal Guru, they are oubarae, they are protected, they are saved. The saev, the service of The True Guru, following The True Guru; n birathhee jaaee, never goes birathhee, never goes in vain. Even if you sit for a secodn with The Guru, you sit there with love. Even if you offer the smallest offering to The Guru, The Guru will always bless you. Don't think that because I only have 5 minutes to sit with The Guru, that I will not gain anything from it. Guruji is saying, that you will always gain something from it. Sit down today, even if you have one breath, with love, say Waheguru. That one breath will be fulfilled, that one breath will be blessed. Serving The Guru never goes in vain, never goes wasted. Rehaao – pause and think about this. When prabh apunae, when my Waheguru is dhaeiaalaa, is blessing me, then what happens? Ghar mehi sookh. That person who is blessed by God, has peace within their home. That means their physical home, and also means their body. Baahar fun sookhaa, wherever they go, they spread peace, happiness and love. When my prabh, when my Waheguru is kirapaalaa, is merciful, Sathiguru Arjun Dev Jee Maharaj says bighan n laagai kooo. No obstacles can obstruct me now. The obstacles which were there are all removed through the grace of God, through the mercy of God.